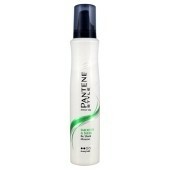 Pantene Smooth & Sleek Mousse Strengthening. Strong Hold Mousse. You have wavy or difficult hair with frizz or flyaways. Smooth out the situation with this lightweight mousse that provides long-lasting hold while helping to control frizz and flyaways. Even helps protect against daily styling damage.